Tile’s official Black Friday 2018 deal is, well, not bad. 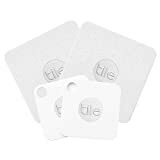 You can get a $35 Tile Sport tracker tag for $20, or a 2-pack for $35. That’s $17.50 per tracker, and it’s a good price if for some reason you need your tracking tags to be waterproof. If you don’t, like most people, then Amazon has a little-known deal going for Black Friday that’s much better. You can snag a Tile Mate and Slim Combo 4-Pack for just $38.30 instead of $60, which drops the per-tracker price to just $9.58. That’s an all-time low, so definitely grab it while you can.